On 8 August 1918, the British Fourth Army, with French support, attacked astride the Somme River on the Western Front. 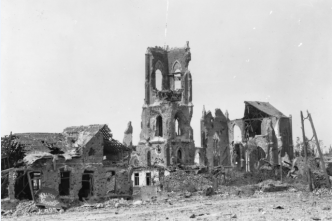 Germany’s de facto commander-in-chief, General Erich Ludendorff, famously labelled the Amiens offensive, as it is occasionally called, ‘the black day of the German Army’, a move that ensured it a place among history’s decisive battles. 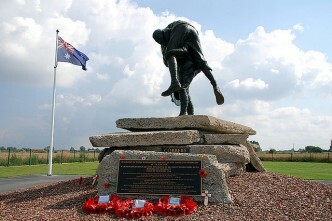 Commanded by Lieutenant General Sir John Monash, the Australian Corps was in the centre of the British advance. Monash initially considered himself ‘the prime mover’ in the genesis of the offensive. Many of the AIF’s senior officers thought so too and patriotic journalism promoted the view, sometimes with the claim that the AIF had ‘won the war’. In recent years, some popular historians and those urging Monash’s posthumous promotion to field marshal have claimed likewise. The reality was different. Determined to capitalise on the Australians’ tactical ascendancy after their success at Le Hamel on 4 July, Monash impressed on General Sir Henry Rawlinson, the Fourth Army’s commander, that his corps could launch a decisive attack if its front was reduced, the Canadian Corps advanced alongside it and the 1st Australian Division, then at Hazebrouck, was returned. On 15 July, Rawlinson told Monash that the Canadians would be available and asked what he needed in tanks and guns. On 21 July, Monash, Rawlinson and others thrashed out the plan. So went Monash’s account. As a corps commander far removed from the war’s strategic direction, Monash was unaware that Marshal Ferdinand Foch, the Allied generalissimo, had wanted to attack on the Somme since March to safeguard Amiens, a vital communications centre. In April and again in May, he proposed an Anglo-French offensive there to Field Marshal Sir Douglas Haig, the British commander-in-chief. Giving the British role to the Fourth Army, Haig told Rawlinson that the Canadian Corps would be allotted to the task. But the scheme was shelved until mid-July, when the ongoing German offensives had run their course. On 24 July, Foch announced that the Allied counteroffensive would begin with the Amiens attack. 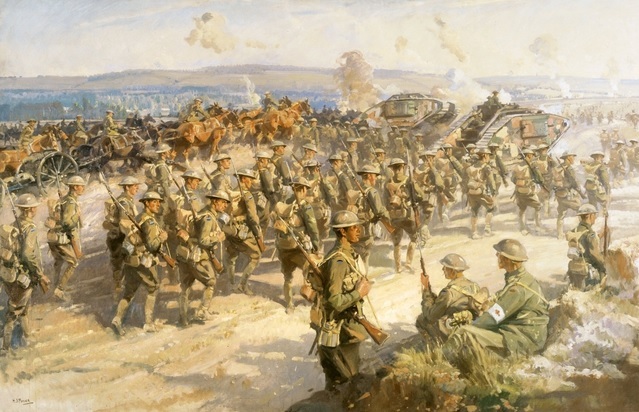 The Fourth Army would assault on an 18-kilometre front with the Australians and Canadians south of the Somme and the British III Corps north of it. Supported by 2,000 guns and 552 tanks, as well as aircraft, armoured cars and cavalry, they were to advance up to 11 kilometres in three phases. Coordination of the various arms followed principles developed by the British in 1916 and 1917 and refined by Monash at Le Hamel. The French First Army would attack further south. If Monash did not devise the Amiens offensive, he was responsible for his formation’s part in it. 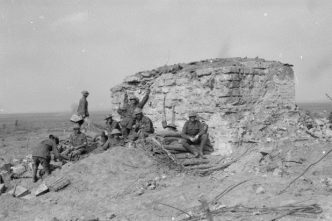 The 8-kilometre Australian assault frontage meant two divisions had to attack side by side. Its depth necessitated leapfrogs, which favoured the divisions attacking first because they could assemble close to their objectives. Those destined for the later phases had to leapfrog them after marching from concentration areas well to the rear. In the deep penetration now proposed, they would have to march a long way. By placing the 4th and 5th divisions closest to the start line, Monash shortened the distance for their approach and assault by 5 kilometres. The 2nd and 3rd divisions would leapfrog them to attack the first objective in a set-piece like Le Hamel and be leapfrogged in turn by the 4th and 5th for the open warfare advance to the deeper objectives. Monash knew the scheme was complex—it had never been attempted before—but trusted the competence of his men to carry it out. 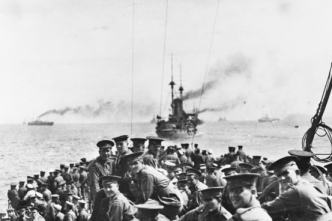 Calling the plan ‘John Monash’s masterpiece’, the Australian official historian, Charles Bean, thought that it would probably be ‘the classical example for the launching of such operations’. The 1st Division was in reserve. At Monash’s insistence, Rawlinson included the German gun line in the attack’s first phase because its capture would prevent the Germans from withdrawing their artillery during the pause between phases and put Amiens outside the range of all but their heaviest guns. 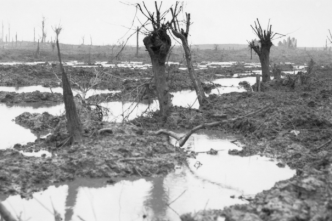 But he refused Monash’s request to extend his line north of the Somme, from which the Germans could enfilade the Australian left flank on the river’s southern side. Monash doubted whether III Corps, which had performed poorly since its battering during the German offensive in March, could clear the northern bank. The Germans were understrength and holding a line nowhere near as formidable as the defences the Allies encountered in 1917. A British journalist watched, enraptured, as the Australians shattered it: ‘The marvel seemed real, the road lay open and dry across the Red Sea … the object of all dream and desire seemed to have come.’ Except on their left flank, where III Corps, as Monash had foreseen, was stalled, the Australians reached most of their final objective by midday. For the loss of 2,000 men, the Australian Corps took 7,295 prisoners, 173 guns and enough engineering materiel to last it for the rest of the war. The Canadians and the French enjoyed similar success. Accustomed to static warfare, commanders—Monash among them—now had to get used to mobile conditions. The transition was not seamless and the advance next day got off to a muddled start. But at least Rawlinson had by then made Monash responsible for the northern side of the Somme. The Australians would advance astride the river until their spectacular capture of Mont St Quentin in September took them beyond it.